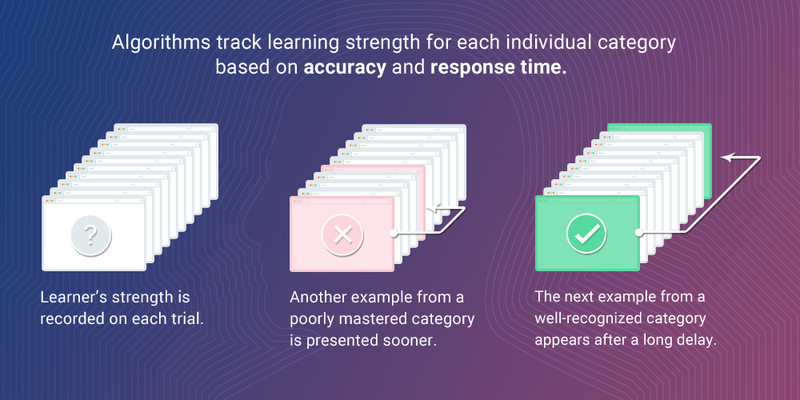 While the term adaptive learning is widely used, our patented Adaptive Response-Time Based Sequencing dynamically adjusts content based on student proficiency. By measuring both fluency and retention, we have created a uniquely efficient learning experience. Our algorithm takes into account both the accuracy and speed of the learner on every presentation. Each item is tracked individually to determine the optimal order of learning material. Our automated sequencing procedures guarantee that items will not be repeated too soon or too late—both of which can impede learning. Less well-learned items will return sooner, whereas better-learned items are spaced further apart. These algorithms attempt to space out presentations for as long as possible, fostering long-term retention of the material. Systems that use learner speed and accuracy to sequence learning events are covered by US Patent #7052277, assigned to Insight Learning Technology, Inc. For more information, please contact us. Mettler, E., & Kellman, P. J. (2014). Adaptive response-time-based category sequencing in perceptual learning. Vision Research, 99, 111-123. Kellman, P. J. (2013). Adaptive and perceptual learning technologies in medical education and training. [Supplement issue.] Military Medicine, 178, 98-106. Mettler, E., Massey, C., & Kellman, P. J. (2011) Improving adaptive learning technology through the use of response times. In L. Carlson, C. Holscher, & T. Shipley (Eds. ), Proceedings of the 33rd Annual Conference of the Cognitive Science Society (pp. 2532-2537). Boston, MA: Cognitive Science Society.